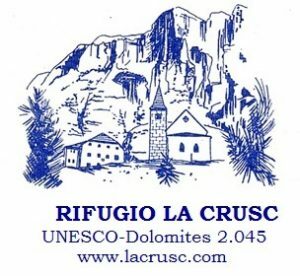 The refuge is located in a beautiful setting at the foot of the “Sass dla Crusc”, nearby the Santa Croce church. It’s accessible from Pedraces via two chairlifts or for those who are willing to go on an excursion it’s also accessible by foot via numerous points. The Santa Croce refuge boasts a family tradition that goes as far back as 5 generations. The farmhouse dates back to 1718. It was built both as a residence for the sacristan and to host and refresh the numerous pilgrims who came to visit the shrine. The interior is quite characteristic, in fact there are 3 Stuben coated entirely in wood, with beautiful inlays and the main hall is made entirely of stone. Accommodation in our refuge is available only during the summer. The rooms are quite simple and are available only with essential services. We have 3, 4 or 5 Bedrooms, provided with bed linen. Toilet and shower are on the floor. In fact, they were designed specifically for those who enjoy hiking and/or mountain biking; basically for those who organize their trips based on going from one refuge to another.